Glen Dash operates a total station to survey Khentkawes Town at Giza during the Foundation's 2006 survey. The pyramid of Menkaure stands in the background. 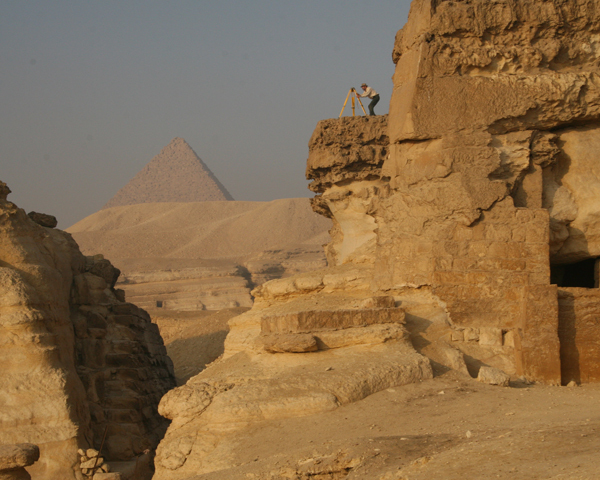 The total station is set upon one of Giza's most important survey control monuments, named GCF1. The rocky outcrop upon which it is set might very well have been used as a control point by the ancient Egyptians themselves. It is one of the few places at Giza where the original surface has been preserved. Everywhere else, the original surface has been quarried or excavated away by the ancient Egyptians.